Choosing the right printer for your business is an important decision. Although it may not seem like it at first, your choice of printer can affect profitability throughout your entire business. The reason this decision is so important is because it touches on nearly all of a small business’s daily processes and operations. Printing documents efficiently and in a cost-effective way reduces the overall cost of every process that requires printing. This is why it’s important to look beyond the up-front costs of print equipment. In order to choose the best printer for your office, you have to choose the printer whose features and average cost-per-page fits best within your particular set of processes. 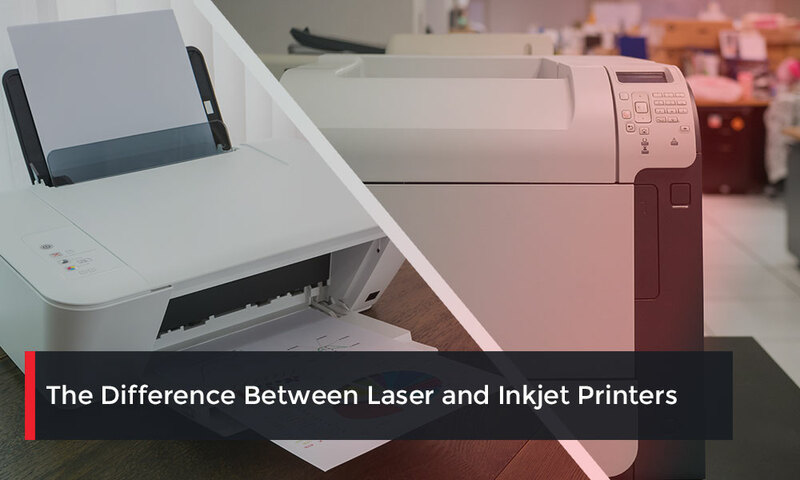 One of the first and most important decisions that will go into this assessment is whether you should purchase a laser printer or an inkjet printer. There are multiple differences between laser and inkjet printers – buying the wrong device for your particular needs will result in inefficiency and waste. The most obvious difference between laser and inkjet printers is the mechanism each uses to create physical copies of digital images. Laser printers reflect laser light from the page onto a sensitive drum coated with ink particles which transfer to the paper using static electricity. Heated rollers then fuse the ink to the page permanently, resulting in a crisp, clear image. Laser printers are fast and economical. Inkjet printers feature printing heads with a very large number of tiny nozzles expelling individual pixels of ink onto paper. Inkjets produce vivid color images at a generally slower rate than laser printers. This mechanical difference makes each printer type suitable for certain prints. For instance, budget laser printers often do not feature color printing capabilities. Color laser printers tend to be more expensive than inkjets, and still do not produce as bright and vivid a result. On the other hand, laser toner cartridges last longer than inkjet cartridges, which can dry out if left unused for too long. Inkjet cartridges also tend to be more expensive than laser toner cartridges. Both laser and inkjet toner cartridges represent a threat to the environment. Although both are recyclable, less than 30% of disposed inkjet cartridges are recycled around the world, and somewhere between 20% and 40% of laser cartridges are successfully recycled. The main difference between laser and inkjet printers from the environmental perspective is that laser cartridges are easier to recycle and offer a less pronounced environmental impact. Laser cartridges can be remanufactured – a process where the used cartridge is rebuilt, refilled, and returned to a like-new state. Ink cartridges contain chemicals that do not decompose easily, and some even contain potentially carcinogenic agents. Many laser printer dealers operate a toner recycling service that supports the toner remanufacturing industry, helping businesses use recycled laser toner instead of brand-new cartridges – and passing on the savings to the customer in the process. For routine home use, both inkjet and laser printers are perfectly acceptable for most purposes. The fact that laser printers require new cartridges less frequently gives them an advantage for the average homeowner, who doesn’t want to have to worry about regularly buying new cartridges, or having them wear out the way inkjet cartridges do. For business, the differences between these devices compound to have a more meaningful impact on everyday processes. Here, laser printers win in every category except one – the quality of color printed documents. Businesses and departments that primarily print invoices, customer forms, and other text-based documents will find laser printers to offer lower costs-per-page, greater printing efficiency, and higher quality than a comparably priced inkjet printer. Even when color is needed, it’s unlikely that customer forms will benefit from bright, vivid coloration in most cases. Finding the right printer for your department requires assessing the department’s regular print needs and finding the device that meets those needs best. Laser printers offer speed and efficiency, while inkjet printers can create high quality color documents. If you produce more text-based documents than photographic-quality marketing materials, you will probably earn the greatest value from a laser printer. It is not unusual for businesses to invest in both printer types in order to optimize their costs-per-page when making documents. Some office managers may choose to outsource color printing to professional wide-format print providers who can create poster-sized marketing materials, and using a laser printer for every day in-house document creation. Do you need expert help finding the right imaging solution for your business? Talk to a DSI print expert and identify the ideal equipment for your office.